The year was 1989, the month was November, and I was a 21-year-old senior at a New England college, when one day in my dorm’s cavernous wood-paneled dining hall—I’ll never forget this—a classmate stood on a chair and announced excitedly to the room that the Berlin Wall was coming down. And so it was; we watched it on TV. The Eastern Bloc disintegrated before our eyes, as though miraculously, and more or less without a shot. “A political earthquake was shattering the frozen topography of post–World War II Europe,” Tony Judt later wrote of those events. “What had once seemed permanent and somehow inevitable would take on a more transient air.” In a mere two years’ time, the Soviet Union itself ceased to exist, and the Cold War nightmare, the only global political reality we’d ever known, was over. As a 21-year-old, I had yet to read any Václav Havel (though his plays and essays were available in English), but it didn’t matter—it was clear enough what was happening. History had been jolted back to life by the explosive, incalculable power of those hundreds of thousands filling the streets and city squares. My fellow students and I were witnesses to the kind of fundamental, world-changing political action that Hannah Arendt (who was so inspired by the 1956 Hungarian uprising) called “the one miracle-working faculty of man.” We literally came of age as witnesses to revolution. As riveting as those scenes were, the revolutions in Eastern Europe and the unimaginable collapse of the Soviet Union were not the only world-altering processes unfolding on planet Earth as my generational cohort came of age. We also came of age with the increasing awareness of global warming (and, like most everyone else around us, did little or nothing about it). Indeed, that very fall, in September 1989, there arrived a book called The End of Nature by a young New Yorker writer named Bill McKibben, who reported and meditated upon the well-advanced science of the greenhouse effect. The year before, NASA climatologist James Hansen had testified to Congress that global warming was in fact happening, as long predicted, as a result of greenhouse-gas emissions, mainly from fossil fuels. (This was no surprise to scientists and executives at Exxon and other big oil companies, who were already well aware of their products’ effects on the atmosphere and the likely disastrous consequences.) McKibben’s book was a probing, extended essay on the deeper meaning of it all, in which he announced the arrival of what today we call the Anthropocene, avant la lettre. Now, three decades and a shelf full of subsequent books since that first warning (most importantly 2007’s Deep Economy and 2010’s Eaarth), and after more than a decade of relentless and increasingly consequential grassroots movement-building as founder of 350.org—fundamentally changing the conversation on climate and the fossil-fuel industry—McKibben has a new book due out next week titled Falter: Has the Human Game Begun to Play Itself Out? (Spoiler alert: it has.) My purpose here is not to review it in full (as a comrade of McKibben’s, I’ll leave that to others), but I will say this much: The book argues convincingly that the unstoppable momentum of climate change, and the exponential and uncontrolled technological leaps in artificial intelligence and genetic engineering, represent possibly insurmountable threats to humanity and what it means to be human. And I’ll offer this: Falter is McKibben’s most powerfully argued book, and maybe his most important since The End of Nature 30 years ago. To me, it affirms him as among a very few of our most compelling truth-tellers about the climate catastrophe and the ideological forces driving it—most notably, in his account, the hyper-individualist, Ayn Randian libertarianism of the Kochs and free-market true believers. And among the stark truths McKibben tells in his new book is that the Kochs and their carbon-lobby friends, given their successful decades-long strategy of deceit, obstruction, and “predatory delay” (Alex Steffen’s phrase), have essentially won. That is, the “climate fight” as we’ve known it—the struggle to prevent “catastrophic” global warming (by any humane definition) and preserve some semblance of the planet that humanity has always known—is lost. The fight now is for nothing less than human survival—while at the same time, and equally important, we struggle to hold on to our humanity. “For many years,” McKibben told me in a 2013 interview (quoted at length in my 2015 book about the climate movement), “I have been very insistent on saying to people that stopping global warming is no longer one of the options. We can keep it from getting worse than it would otherwise get—and the difference between a world where the temperature has gone up two degrees [Celsius], and a world where it’s gone up four degrees, is a difference very much worth fighting for. It might prove to be the difference between a world with civilization and a world without it.” Even then, scientists were telling us that warming of two degrees—a virtual certainty absent radical global action—would likely be devastating for most of humanity, starting with the poorest and most marginalized, and that four degrees, our current business-as-usual trajectory within this century, could well lead to an uninhabitable planet. You see, Bill McKibben was a climate doomist before “doomism” was cool. But being a doomist—that is, by my definition, accepting the fact that almost any possible future now involves catastrophic levels of climate change—is not the same as being a fatalist, much less a nihilist, as some would have it. Because McKibben has also been telling us that there’s a range of possible climate futures, along with a range of possible social futures that will determine how and whether we prepare for and live through what’s coming. How hot and chaotic it gets within this century—and how democratic or undemocratic, how just or unjust, the response—will depend on the choices humanity makes right now. Most of all, the big political choices, the kind that can radically shift economies and societies around the world. In other words, as McKibben and many others, including writers like Naomi Klein (and even yours truly), have been arguing for years, together with indigenous and other frontline-community leaders (represented, for example, by the Climate Justice Alliance), it will depend more than anything on our social movements and how hard we’re willing to struggle—together and for the long haul—against those obstructing and delaying any sane and equitable path forward. And not simply against the carbon lobbyists and their corporate masters, or the science-denying politicians who feed at their trough, but also against those across the political spectrum whose power and status depend upon the willingness of many to live within a lie. But at this late date, maybe the most damaging lie we tell ourselves is this: that the climate catastrophe will ever be seriously addressed within the corporate-owned and -operated political system, the mockery of democracy, under which we live; that business and politics and even activism as usual can continue if we want any chance of a livable—to say nothing of a just—human future. It’s an inspiring statement, the kind I’ve come to expect from my friend Bill McKibben. And so the question is: What do honesty and engagement require of us—those of us privileged enough to be having this conversation—now? McKibben’s purpose in the book is not to sketch the contours of such a revolution, but I wish he’d said a bit more about the nature of the radical political change necessary at this point—the kind of change the nonviolent resistance he calls for must bring about if we’re to have a chance. Because given what science is telling us about our acceleration toward climate catastrophe and what that means for humanity’s future, together with the facts McKibben lays out about our political system’s failure to respond, it feels increasingly like something fundamental has shifted, that the nature of the climate struggle has irreversibly changed—that if the “old” fight is lost, then the “new” fight (if we can even call it new) is of a wholly different order. And so we have to ask ourselves, how does one build a movement powerful enough to meet the challenge if one isn’t clear about the nature of the challenge? Because the challenge now is nothing less than transforming the global economy and shutting down the wealthiest, most powerful, and most ruthless industry on Earth—one that effectively owns and controls our political system—within the next decade or two. Recall that the Intergovernmental Panel on Climate Change’s major report in October concluded that holding warming near 1.5 degrees Celsius—preventing hundreds of millions of deaths and social chaos and conflict on an unprecedented scale—requires cutting global greenhouse emissions by roughly 50 percent by 2030 and eliminating them by mid-century, together with the massive deployment of “negative emissions” technologies that are unproven at anything like the necessary scale. Even with the assurance of experts that the radical global transformation required is technologically and economically feasible, the idea that it’s still politically possible to avert two degrees Celsius of warming—much less 1.5—if progressive Democrats in this country simply organize more effectively, and elect the right candidates in 2020, borders on utopian fantasy. Politics and activism as usual have failed—global emissions, of which the United States now accounts for only 15 percent, are rising, not falling—and it defies reason to think that more of the same will save us. As one who has now given more than a few years of my life to the climate struggle, this is not easy to say. And yet honesty now requires us to recognize, in the face of these dire scientific and political realities, that the climate movement’s time has passed. The movement that McKibben and countless others have spent the past decade and more building—bringing many hundreds of thousands into the streets, inspiring thousands of acts of civil disobedience, giving rise to a new generation of young activists demanding climate justice—is no longer sufficient, if it ever was. It’s been clear for some time now, since well before Trump’s election—around the time Barack Obama and the Democratic Party sold out to the carbon lobby with an “all of the above” energy policy that made the United States the world’s largest producer of oil and gas—that a social and political movement built primarily around climate change, or even the concept of climate and environmental justice, will never build enough power on its own to break the death-grip of corporations and private wealth on our political system. At least, not in the time we have. The sheer depth, scale, and speed of the changes required at this point are beyond anything a mere climate movement can possibly accomplish, because such a movement is inherently unsuited to the nature of the task we face: radically transforming the political-economic system that is driving us toward climate breakdown. 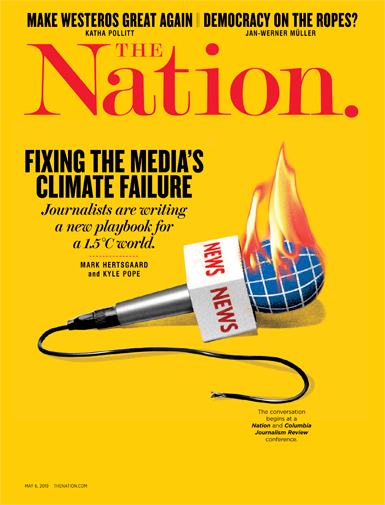 Given the sclerotic system in which the Green New Deal—the only proposal ever put before Congress that confronts the true scale and urgency of the climate catastrophe—is dead on arrival, mocked even by the Democratic Speaker of the House, the pretense that anything less than revolutionary change is now required amounts to a form of denial. This is not to say that climate activists should simply stop what they’re doing and go join “the revolution.” (Well, maybe some of us should.) We still need action at all levels to keep carbon in the ground—all of those fights are vital, indeed are part of the revolution we need. And yet climate activists have no choice, at this late date, but to approach this work differently, to understand it differently, not merely as “climate action,” but as part of something larger, more fundamental, more radical—a broad, nonviolent revolutionary movement for democracy and human rights. This is why the vision of a comprehensive Green New Deal put forward by Representative Alexandria Ocasio-Cortez and her young allies, Justice Democrats and the Sunrise Movement, is such a desperately welcome development. Its aims, which include fully decarbonizing the US economy, putting the fossil-fuel industry out of business in this country within a mere decade or two—while at the same time putting jobs, health care, and racial justice at the center of the GND’s 10-year national mobilization—are, in fact, revolutionary. That is, serious. And those pushing for it, especially the young people whose lives are literally on the line, need to own this. 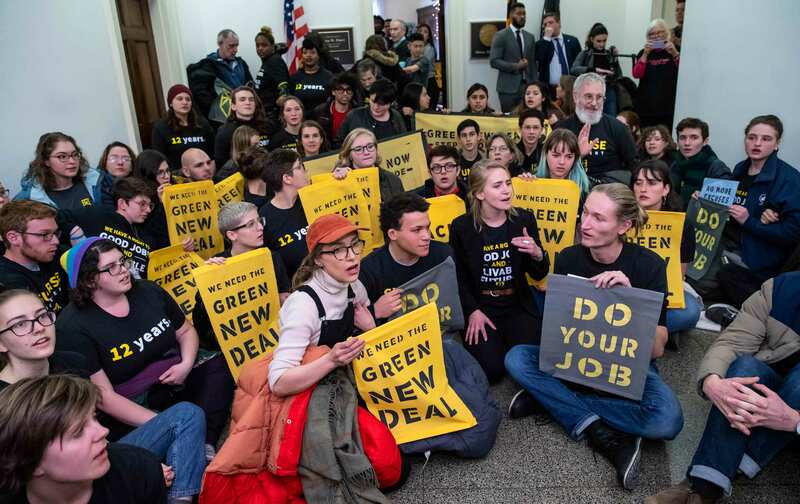 If the Green New Deal is to be as radically transformative as we know is necessary, then it must be more than just another legislative policy agenda for the Democratic Party. It needs to be among the central rallying points for a revolutionary democracy movement, or “movement of movements”—with principles of climate and environmental justice at the core—into which the various strands of the climate movement fold themselves as one part, or rather, many interwoven parts. Otherwise, the proverbial cart—transformative policy—is before the horse: transformative democratic power. The revolutionary aims of a comprehensive Green New Deal—necessary for a chance of averting those apocalyptic scenarios—require a democratic revolution. Given how far we are from realizing anything close to such a vision, all of this might understandably induce the despair of which McKibben writes. And yet, even if such a revolutionary movement is exceedingly unlikely to succeed within the short time frame we have—even if it is too late to prevent runaway warming and some sort of global collapse—this revolution will still be worth fighting and sacrificing for, even dying for. And it always has been. Because the only thing more horrific than runaway climate catastrophe is the very real prospect of living into it, within mere decades, under a racist, nationalist, militarized, oligarchic political system that is leading us toward, if not already becoming, an authoritarian police state. The only thing worse than climate catastrophe is climate catastrophe plus fascism. Yes, I know, talk of “revolution,” and not as a metaphor but the real thing, tends to scare people, including people on the left, and understandably so. (I mean, it scares me.) And it makes the cynics and the fatalists and the Very Serious types roll their eyes. Granted, it can be difficult to imagine such a revolutionary mass movement in this country right now. Unless, that is, one can imagine a movement that looks like the sum of the grassroots mobilizations we’ve already seen in recent years. Unless, in other words, one can imagine Standing Rock and Black Lives Matter, the Poor People’s Campaign and the People’s Climate March, Occupy and the Fight For 15, the Women’s March and the March for Our Lives, Sanctuary Cities and Moral Mondays, #NoKXL and #NoBanNoWall and #AbolishICE. Imagine all of these—and more—not as separate issues and campaigns but one massive solidarity movement; and not as a series of one-off events but a strategic, sustained, disruptive, nonviolent mass mobilization to bring business and politics as usual to a halt in this country—by means of large-scale direct action, general strikes and noncooperation, taking and occupying public spaces, and a willingness for genuine sacrifice—in order to force a confrontation with the American political system that cannot be ignored or co-opted; to force a reckoning. In other words, unless one can imagine an authentic struggle for democracy. Of course, even with such movement-building, nothing is apt to change if we stay in our single-issue silos or try to impose strict ideological uniformity across an entire movement of movements. As Václav Havel argued, rather than loyalty to abstract ideas and doctrines, we need more than anything loyalty to one another as human beings. Fine words, but not worth much, as Havel knew, if words were all they remained. And so he points to what he sees “becoming evident” in the world: namely, that explosive, incalculable power of “a single, seemingly powerless person who dares to cry out the word of truth and to stand behind it with all his person and all his life, ready to pay a high price”—that is, the power of living within the truth.